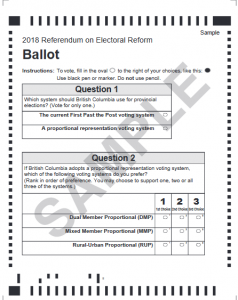 Next week BC residents will start to receive voting packages in the mail for the referendum on electoral reform. The BCCLA is excited for this opportunity to shift to a proportional representation system, as it would enhance the influence of each individual vote, something that we called for last year in our ten justice reform priorities for the province. This blog will explain why the three arguments commonly used to argue against proportional representation don’t add up. In fact: There is no correlation between the proportionality of electoral systems and political party extremism. Though it is true that proportional representation systems have been shown to enable a greater spectrum of ideologies among political parties, that doesn’t translate into extremism, because proportional representation systems also promote public negotiation to enable coalition governments. Many systems of proportional representation – including all models proposed for BC – require a party to get a certain number of votes (5%) to have any parliamentary seats. This mechanism keeps out extremist parties because they have a harder time passing the threshold. Plus, first-past-the-post systems do not prevent controversial figures from gaining power through a false majority (i.e. when a candidate or party receives less than 50% of the vote but wins more than 50% of power). Rodrigo Duterte was elected in the Philippines with this system, and his presidency has supported thousands of extra-judicial killings. Or just look south of the border to President Trump, elected using a first-past-the-post approach. In fact: Those opposed to proportional representation claim that if the referendum succeeds, we will no longer have a local MLA to represent our views. All three systems proposed for the province, however, are hybrid systems. This means that all potential reform models will continue to ensure that everyone in BC has a local MLA. In fact: Under first-past-the-post, it’s common for more than half the votes to be wasted (because if you do not vote for the front-runner in your riding, then your vote does not count towards electing anyone). With proportional representation, most votes do help elect someone – when your vote doesn’t help elect the front-runner, it can still help elect the second or third most popular candidate. Bonus Fact: There is an escape clause! 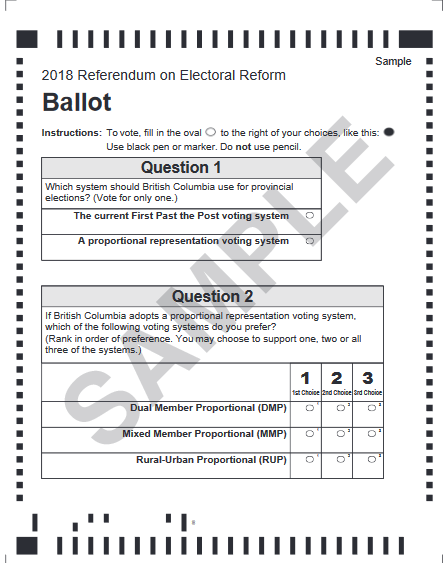 If BC opts for a new proportional system, a second referendum will be held following two election cycles. At that point we will have another opportunity to choose whether to keep that system or revert to the first-past-the-post voting system. So in the unlikely event that we regret adopting the electoral system that most democratic nations use, we can always revert back to the system that we’ve always known. We are wonderfully positioned to give our electoral system a major democratic upgrade, with built in safe guards. We should go for it! To learn more about why BC should abandon the first-past-the-post system, click here. To learn more about how to vote, click here. Previous Post: Should there be a Provincial Policy on Street Checks? Next Post: Welcome to our new staff!